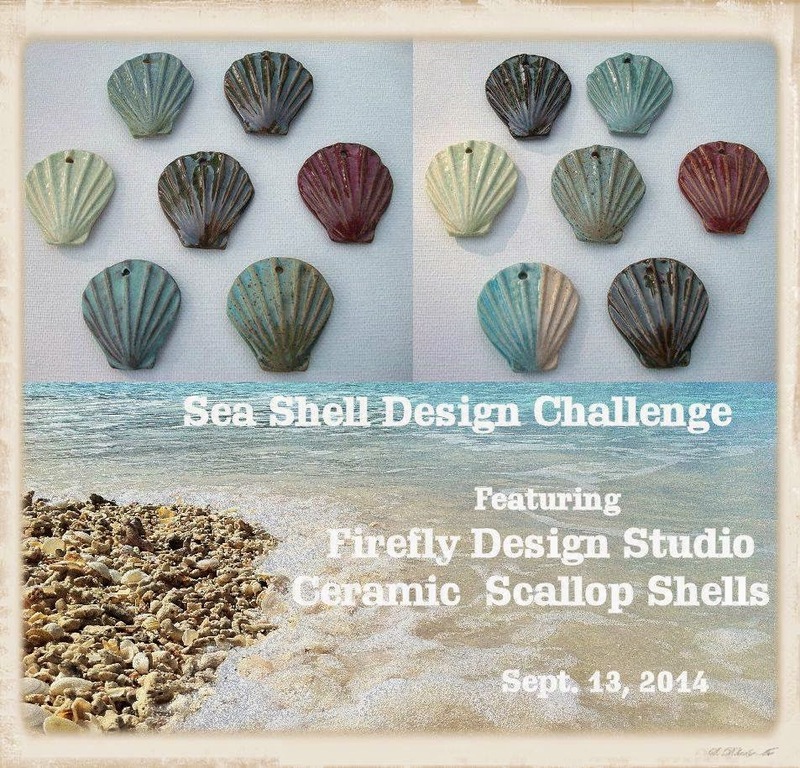 My generous friend, Rita of Toltec Jewels put out a challenge in one of the beading groups to which I belong: create a piece using a ceramic scallop shell pendant by Firefly Design Studio. Michelle (the creative genius behind Firefly Design) is also a member of the same group, so this was a particularly fun challenge for me. Rita even supplied the shells for participants (thanks again, Rita!!). I pulled some glass seed beads and s-lon cord I thought might work with the sagey green and soft blue in the pendant and then played up the background color of the clay as well, adding some gold and bronze. I started knotting around a center ring and let the cord fan out from that like ripples in the water. I didn't have any pattern in mind when I started, I just let the micro macrame wander and flow around the beads. The necklace ended up with a unique keyhole shape which gives a hint of the exotic and the lavish beads and scalloped knots gives it an over-the-top, excess feel, like a mermaid dripping in jewels. The sea shell pendant is actually drilled at the wider end, but I wanted to suspend it the other way around, so I added a bail to the narrower end of the shell. That left me with a hole at the bottom to attach a ring full of beachy charms - a shell, some starfish beads and even a Vintaj seahorse. So? Can you picture this on your friendly neighborhood mermaid? "Over-the-top" doesn't usually appeal to me (sorry, I'm no mermaid), but I love those curves combined with the simplicity of that seashell! And I like how you situated that shell with its extra danglies. What a beautiful design! I can definitely see my friendly neighborhood mermaid wearing it. Exquisite! I think this is my favorite piece by you yet! Wonderful ART! The colors, the movement and soft flowing scallops of your macrame are perfect with the two-toned ceramic shell -- love the details, the wonderful touches of rich color, the charms... beautiful! I want to feel like a mermaid... wearing this treasure would feel beautiful! Oh my, this is perfect! Such lovely macrame to showcase the shell. Wow what an amazing design, and so beautifully made! How fab would this look at a beach wedding! Yes, this is ART, I was thinking a museum piece. Your freeform never ceases to amaze me. Ido not think I will ever be able to achieve that. It is perfect, the colors, the flow, the creativity. Niky is right, can't you just see this at a beach wedding. Thank you for sharing. I love Art Jewelry and this is one of the finest pieces I've ever seen. Beautiful! Wow, awesome amazing, I love this piece. Wow....just wow. What a gorgeous, gorgeous necklace!! Well done, dear!